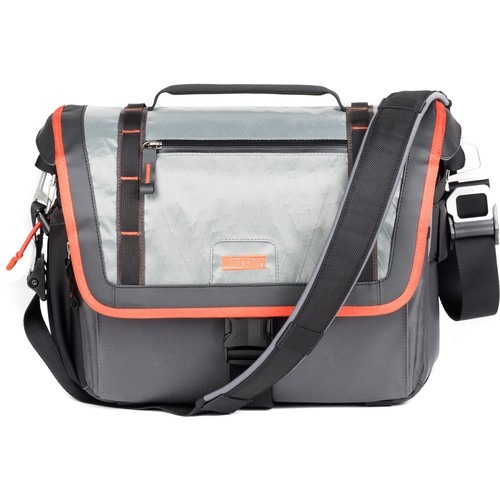 The main compartments of the Exposure will be very familiar to anyone who has used other shoulder-style bags from Think Tank. You get a large padded area that you can configure just about any way you want with the ample supply of dividers provided. I tend to split it into three vertical areas, with a camera body and longish lens (we’re talking 80-400 or 70-200 or smaller here, remember this is a shoulder bag – if you need a 200-400 or a 300/f2.8 you’ll need something bigger!) in the middle section. That lets me put another lens on one of the sides, perhaps loaded on top of a TC other accessories, and a flash and some computer accessories in the other section. Quick gear notes: These bags are best with mid-size DSLRs that are not gripped, or mirrorless cameras. The 13 will fit a 70-200 f/2.8 or 80-400 separate from your camera, while the 15 will accommodate them when attached. In addition you get a fully-padded separate compartment for your laptop. As the name implies, the 13 will accommodate a 13-inch laptop, and the 15 will fit a 15-inch model. Tripod straps can be affixed to the bottom. There are also attachment points on the top, that I use to lash a jacket to the bag most of the time. There is a closed document pocket in the back, and plenty of nice traditional “briefcase-style” pockets in the front, including a keychain leash that I use for my digital wallet. You can even fit a tablet in the zippered front section. The front pockets can be expanded if you’re like me and always have one more thing to take along. There is also a slim zippered pocket in the cover that is cloth lined especially for phones. On one side of the bag is a water bottle pocket, while the other features a rail you can use to attach modular accessories. The bag comes with a fairly traditional shoulder strap, but it is set up so that you can put it over your opposite shoulder as a sling bag. There is an additional strap to keep it in place in that configuration for extended treks. I loved that flexibility. For short jaunts I could throw it over my shoulder, while if I needed to cover some ground I could make it into a sling. That’s also the perfect way to use it in the field. I’m looking forward to using it as a field bag on our Alaskan Bear Photo Safaris in July. That’s a situation where we often can’t set our bag down (think standing in the surf or the mud), and weather can change in a heartbeat. The sling configuration lets me swivel the bag around to get at my second camera or a different lens quickly and easily. Even without the rain cover, the Exposure bags feature waterproof sailcloth on top, weather flaps, and a waterproof bottom panel. If the weather gets to be too much, then the rain cover will make sure everything stays tidy even in nasty storms. The materials are also abrasion resistant so they can take some abuse from bouncing vehicles, passing branches, or jostling in crowds. For the wildlife safari portion of our trip, I relied on my trusty Think Tank Streetwalker Pro as my main camera bag. It’s combination of rollers and backpack make it ideal for transitioning from those annoying international airport transfers to shooting from a safari truck. If you don’t need the rollers, the older Think Tank Streetwalker Harddrive is a great alternative. For the long haul flights and connections, I used the rear “strap” on the Exposure to slide it over the Streetwalker so I could easily bring both with me through airports and hotels with no additional effort. Once in camp, the Exposure made a great bag for use on walking safaris and also for carrying my laptop and single camera around. In Cape Town and Johannesburg, the bag really came into its own. We had a mix of weather, not enough to need the rain cover, but enough that I was happy to have the weather-resistant Exposure bag protecting my cameras. I could take the bag anywhere with confidence in it, and that it wouldn’t look out of place. That included everything from Penguin refuges to fancy restaurants. Instead of a second lens, I stashed my DJI Mavic Pro drone and remote control. People were shocked I could pull it out of my briefcase and have it up in the air almost as fast as they could set up a tripod! By leaving my laptop back at the hotel the bag was also plenty light to carry for extended periods without thinking about it. I’m really looking forward to putting the bag through some more field testing in July when I take it as my field bag up to Alaska. You can get the Exposure bags either in a very-subtle Tactical Black or my favorite Orange, Silver, and Black Solar Flare. Even better, the MindShift Exposure 15 is only $169 and the MindShift Exposure 13 is even less, at $159. Exterior: For superior water-resistance, all exterior fabric has a durable water-repellant (DWR) coating, plus the underside of the fabric has a polyurethane coating. It also has YKK® AquaGuard® (weather resistant) zippers, high-performance Sailcloth, 420D velocity nylon, 600D polyester, heavy-duty nylon tarpaulin, UltraMesh pockets, anodized aluminum hardware, nylon webbing, 3-ply bonded nylon thread. Interior: PE board reinforced removable closed-cell foam dividers, 200D liner, PU backed nylex liner, 2x PU coated nylon 190T seam-sealed taffeta rain cover, 3-ply bonded nylon thread.